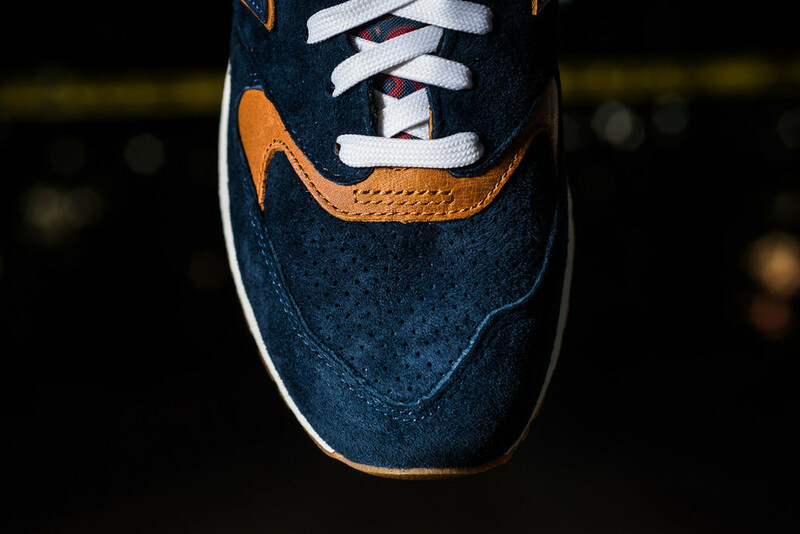 New Balance x Sneaker Politics "Case 999"
HBO TV series "True Detective" takes inspiration on New Balance next collaborative work with Louisiana very own base Sneaker Boutique Politics. The True Detective is a series that shows all the insides and outs work field of a detective and all the scenarios that capture serial killer criminals. The show takes place in Louisiana so what better way then taking the series and making a sneaker out of it. HBO is the tip of the ice, which other major TV series will inspire a sneaker boutique to put it on their design. Maybe Empire, The Walking Dead, Game Of Throne, we can only wait and see. The NB 999 take hints of Horween Leather brown on the inner lining and thoughts the side and front toe. it will conduct a premium pig skin suede body in blue. paisley print will fit the tongue, and a custom inner sole with candy strip and a P to make it a Sneaker Politics official. Finally sits on a red, white and gum sole bottom. To those who like solving crime, try solving it in style. Pick up your pair of the Limited Edition CASE 999 this Saturday at both location by first come first served. Thanks for hitting up our blog. Make sure you share, give it a heart, and remember to stay fresh ! Every year, New Balance releases a collection of Made in England sneakers that reference iconic elements in British culture and landscape, and in 2015 the focus turns to the local pub with the Real Ale Pack. Inspired bu traditional British beer brewing and the pub culture that is inherent to life in the UK, each of the three sneakers in the collection represent the colors of different type of real British ale. All three models are available at both location by first come first served, place your orders by calling and reaching your local store (contacts above). Premier x New Balance 998 "PRMR"
History is being made with the first ever collaboration between top foot brand New Balance and Premier Boutique. With two based stores in one of the hearts of Michigan, Grand Rapids, Premier does it right going deep in their roots of MI to pay homage to the heritage of the state. Known for their rich history of 20th century automobile manufacturing, Michigan is the home to three major car brands Ford, GM, and Chrysler. The inspiration will come with full attention to detail and is a nice piece to any collection. Start your engines the shoe releases this weekend, exclusively at our Flag store Long Beach on a first come first served basis. Camper's welcome remember to Like, Share, and Comment. Stay Fresh ! Inspired by one of the most significant mountains in the world. New Balance sets to release it's new concept the Napes Pack. Also known as the Nape Needle or Great Gable this pyramid shaped rocky mountain is a climbers paradise and is a trademark for the England Lake District. Both shoes are inspired by the gear and colors worn by climbers, It is also constructed in it's home town England and is set to be a Limited Edition. What makes this a phenomenal release ? The detail is on point, marking it with an England flag on the back heel, textile's and materials utilized in climbing gear, and a embroidered NY210100 marking it's (location) or OS grid. Mountain climber's or just a sneaker head enthusiast, this shoes can set your fall need and break your from the ordinary. Thanks for stopping by and checking out our blog. Remember to Like, Share, and Comment. Stay Fresh ! Long Beach's beloved and local superstar from CSULB will take his next step from a big Sneaker Head to the next level of reputation, a official Collaborator. New Balance teams up with Tampa Bay Rays third baseman Evan Longoria aka LOGO to design and bring you the New Balance 530 "Black Sheep" in a Limited Edition with only 1,008 pairs made. As most may know Evan debuted the MLB in 2008 where he was named American Team league during his participation in the All-Star Game. Longoria was also name the 2008 Rookie of the Year, since his official debut he has been a three time participant for the All-Star games. Today Longoria is considered one of the best active third baseman in the league. If baseball is your field then this is the sneaker for you, dripped on sheep skin and engraved in special details the shoe comes with two separate laces, a black wax lace to keep the toughness while on the field and a grey lace specked out with metallic silver for off the field. Private x New Balance will be launching the shoe exclusively at our Long Beach location with a special event Saturday May 30th from 5-7pm on a FCFS basis, free gifts and party environment will be set, hope to see all our local customers there. remember to Like, Share and Comment. Stay Fresh ! Come one Come all New Balance is in the house, bringing some of the most unique color tones and high quality products, amazing concepts like the Guitar Pack Urban Research collaboration straight out of Japan, Made in USA tailor made and some OG models that never get old. Make sure you come and check the Superstar line up and one of Privates biggest stock orders to date. Some of the models featured might not be available, please click on the Contact link and reach your local shop for size availability and pricings.